Tim Burton's original Batman movie was one of my favourite films when I was growing up - the scene in which the Joker gives one of his colleagues an 'electrifying' handshake is indelibly printed in my mind - so I was looking forward to reacquainting myself with it. Whilst the movie wasn't quite as great as I remembered, and certain elements now look a little dated (particularly those scenes where the Prince soundtrack is prominently featured), there's still a lot to enjoy here. 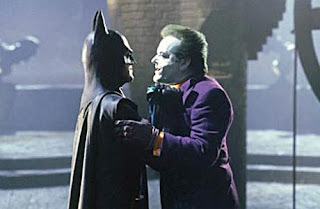 Jack Nicholson makes for an enjoyably flamboyant and sardonic Joker, Michael Keaton is a solid Batman, and Gotham City is beautifully realised by Tim Burton as a gothic urban nightmare. On the other hand, Burton isn't the greatest director of action scenes, and these sequences pale in comparison to Chris Nolan's more recent Batman movies. I was also a little irritated by Robert Wuhl's rather hackneyed portrayal of a sleazy Gotham journalist. Still, on the whole, it's one of the stronger superhero movies out there. This is a bit of a strange one - I was sure that I'd seen this movie previously, but having now rewatched it, I'm not sure that I didn't just catch the climactic battle scene between Batman and the Penguin on TV without having seen the rest of the film. Anyway, Tim Burton's second (and to date final) Batman effort is a bit of a mixed bag - it looks fabulous, and is a masterpiece of set and costume design, but is a little lacking in the story department. The rather loose plotline sees the Dark Knight face off against a trio of foes of different stripes. We have the Penguin (Danny De Vito), the hideously deformed son of a wealthy family who has been living in Gotham City's sewers from an early age, nursing a grudge against society. Then there's Catwoman (Michelle Pfeiffer), a formerly mousy secretary, who awakens from a fall from her high rise office building as an enigmatic superpowered feline. Finally, we have evil businessman Max Shreck (Christopher Walken), publicly respectable, but secretly plotting to steal the city's energy resources. Burton's fascination with gothic Victoriana is given full rein here, and it is obvious that his sympathies lie with the freakish Penguin and his cadre of clowns and other circus performers, rather than with Batman (who is pretty much a supporting player in his own film here). As with the first Batman movie, the action scenes aren't particularly well executed, but it's still an enjoyable film to watch - even if it's just to soak in the gothic ambience of Gotham City. I absolutely adored the original Swedish version of this movie (Let The Right One In), so I was curious to see how Matt Reeves' American remake would shape up. To be honest, although this is a solid effort, I wasn't blown away by it. It's kind of like seeing a band play a competent cover version of a song you love. Although the song's still great, the magic that's there in the original version has been lost. Very little has been changed here in terms of the storyline (both movies tell the story of a lonely, bullied young boy who befriends a vampire which moves in next door). Indeed, many of the scenes from the Swedish version have been replicated exactly in the American version, though the action has been moved from suburban Stockholm to Los Alamos, New Mexico (a similarly snowy locale). A couple of the points which have been changed didn't really work for me - for one thing, the way in which the special effects used to show the spider-like movement of the young vampire look distractingly bad at times. For another, the method used by the vampire's assistant to trap his victims seemed a little implausible to me - are we supposed to believe that he'd been able to hide out in the back seat of their cars for years without having the driver or a passenger look behind them carefully? Anyway, despite good performances from the two young lead actors (Chloe Moretz and Codi Smith-McPhee), and the always reliable Elias Koteas, I definitely prefer the original. This movie has become comparatively famous for showcasing blockbuster special effects on a shoestring budget (with the monsters in question being created on director Gareth Edwards' laptop). 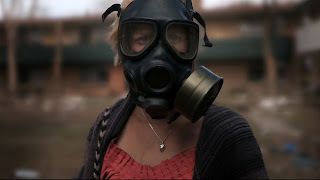 It's a kind of sci-fi/ horror/ road movie hybrid, set in a near future in which creatures from outer space have crashlanded in a large area between the USA and Mexico; the US and Mexican militaries have erected huge walls in an effort to keep the beasties confined to this region, which has become known as the 'infected zone'. Photographer Andrew Kaulder is set the task of getting Sam, his boss's twentysomething daughter through this infected zone and back into the States in one piece. All of that makes the film sound a lot more exciting than it really is - as Sam and Andrew make their way North, they don't encounter too many of the promised monsters, and instead, much of the film's running time focusses on the developing relationship between the two characters. This would all be fine if the characters were more sympathetic, but I didn't find them to be so. Andrew, in particular, seemed pretty obnoxious - a brash, arrogant fool whose idea of communicating with the locals involves shouting VERY LOUDLY in English. In my opinion, if you're going to call your movie 'Monsters', you may want to include a few more scenes which actually feature battles with evil looking criters. I'm off to get my good friend Lionel Hutz to sue the film's producers. I feel I've been the victim of the most blatant case of false advertising since his suit against the makers of The Neverending Story. Paul Giamatti plays himself (or a version of himself) in this Being John Malkovich-like comedy drama. Unable to prepare properly for a stage performance of Uncle Vanya, he finds himself lured in by an advertisement in a recent issue of the New Yorker, informing him of a company based on Roosevelt Island which offers services in soul storage and transplantation. Unfortunately, as Bart Simpson would no doubt attest, once you've given up your soul, it's pretty damn hard to get it back. 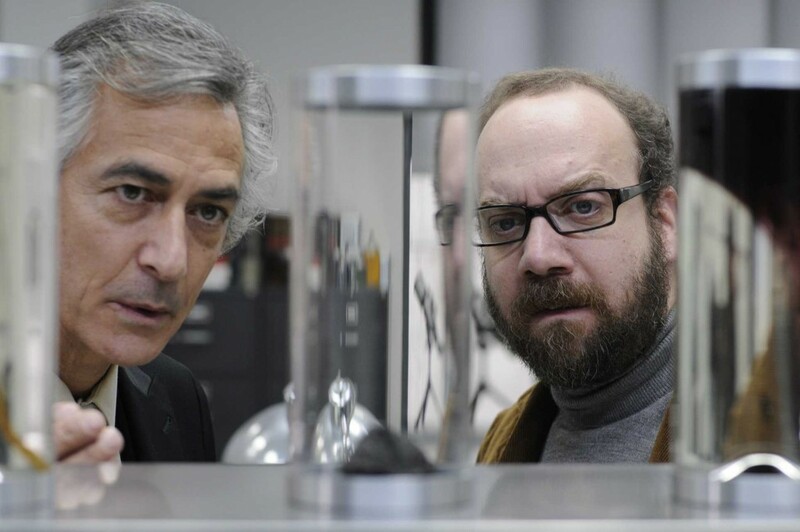 Although Giamatti doesn't suffer the indignity of having his soul traded for ALF pogs, he is forced to make his way over to Russia in an effort to track down it down. The idea that Giamatti would give away his soul in order to play a part better seems a little flimsy, but this movie makes the most of its unusual premise. It's rarely laugh out loud funny, but it definitely has the novelty factor on it's side, and I was never bored. Giamatti performs some solid work in the central role, and is ably assisted by Dina Korzun (as a Russian 'soul mule') and David Straithairn (as a sleazy doctor). It didn't get much of a release in the UK (not sure if it even made the cinemas), but is definitely worth catching on DVD.